Antoine McColister (born May 11, 1988), better known by his stage name Ace Hood, is an American rapper. He was born in Port St. Lucie, Florida and raised in Deerfield Beach, Florida. He was formerly signed to DJ Khaled's label We the Best Music Group, Def Jam Recordings and Cash Money Records. His song "Top of the World", from his debut studio album Gutta, was featured in the basketball simulation game, NBA 2K10. He has released four studio albums with his most successful being his last two albums, Blood, Sweat & Tears (2011) and Trials & Tribulations (2013). He is best known for the hit singles "Hustle Hard" and "Bugatti". In 2016, McColister announced his departure from We the Best Music. Ace Hood at Howard University's homecoming in 2008. Port St. Lucie, Florida, U.S. Ace Hood was born in Port St. Lucie, Florida, on May 11, 1988, and was raised by his mother with his younger cousin Ty Barton, Jr. in Deerfield Beach, part of Broward County. He graduated from Deerfield Beach High School. Following a football injury in the 10th grade, and after realizing he wouldn't be able to go pro, the Broward County native began to seriously consider rapping as a career. So Hood teamed up with a local group called Dollaz & Dealz and released a single titled "M.O.E." in 2006. He also began promoting himself via open mic events and talent shows around town. In 2007, he met DJ Khaled outside the office of the WEDR 99 Jamz radio station. 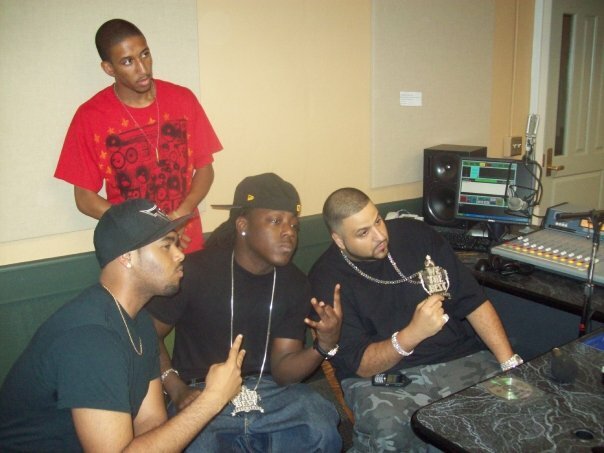 After Hood gave Khaled an autobiography and his demo tape, Khaled asked Hood to do a freestyle over the instrumental of his song "I'm So Hood" from his second album, We the Best, and later signed Hood to his We the Best Music Group label. Hood was named, along with several others, on the Freshmen of '09 by XXL magazine. His first album, Gutta, was released in 2008. Singles included "Cash Flow" featuring T-Pain and Rick Ross, and "Ride" featuring Trey Songz. Hood also released mixtapes called Ace Won't Fold and All Bets On Ace. He made a guest performance among several rappers on DJ Khaled's single "Out Here Grindin'", also featuring Akon, Rick Ross, Plies, Lil Boosie and Trick Daddy, which peaked at number 38 on the Billboard Hot 100. It is from Khaled's third studio album We Global, and was eventually certified gold by the RIAA. Ace Hood appeared on Wildstyle Radio on WUAG 103.1FM in Greensboro, North Carolina, on September 7, 2008, to promote his album, Gutta, along with DJ Khaled. The album debuted at number 36 on the Billboard 200, selling 25,000 copies its first week. On June 30, 2009, seven months later, Hood released his second album, titled Ruthless, once again on Def Jam. The albums first single was "Overtime", which was produced by The Runners and featured Akon and T-Pain. The album's second single is "Loco Wit The Cake", which was produced by Schife, of the Palm Beach County Karbeen Mafia. The album's guest list includes Rick Ross, Ludacris, Jazmine Sullivan, The-Dream, Birdman, and Lloyd. The album debuted at number 23 on the Billboard 200, selling 20,000 copies its first week. Hood confirmed that his third album will be called, Blood, Sweat & Tears. It was released on August 9, 2011. The first official single, "Hustle Hard", became Ace's highest charting solo single, peaking at number 60 on the Billboard Hot 100. The second official single is "Go 'N' Get It". Both tracks are produced by Lex Luger. The third single is "Body 2 Body" featuring Chris Brown and the song is produced by J.U.S.T.I.C.E. League. It peaked at number 65 on the Hot 100. The album features artists like T-Pain, Yo Gotti, Kevin Cossom, Rick Ross & Lil Wayne. The album debuted at number 8 on the Billboard 200, selling 26,000 copies, becoming the rapper's most successful album so far. He promoted the album with his first concert tour, the Hustle Hard Tour. He also appeared on three tracks from DJ Khaled's fifth studio album, We the Best Forever: "I'm Thuggin'", "Future", and the "Welcome to My Hood (Remix)". Hood started 2012 by collaborating with Cash Money Records artist Bow Wow on a song called "We Going Hard". He will be appearing on Maybach Music's Self Made Vol. 2 album. Birdman and DJ Khaled signed Hood and We The Best Music Group to Cash Money Records. Hood will be recording his fourth studio album under We The Best and Cash Money Records. He has made guest appearances on tracks by other recording artists such s Talib Kweli, Jadakiss, Brisco, and "The Drill" by The Game, also featuring Meek Mill, which appears on his California Republic. For his debut single on the We The Best & Cash Money label, he reunited with Trey Songz after 4 years, to make the early-2000s-styled love single known as I Need Your Love. The song is produced by Ben Billionz. Hood released his mixtape Starvation 2 on January 10, 2013. The mixtape features guest appearances from Meek Mill, French Montana and Plies. On January 16, 2013, Hood announced his fourth studio album titled Trials & Tribulations and released the first single from the album titled "Bugatti" featuring Future and Rick Ross. The song is produced by Mike WiLL Made It. On February 6, 2013, the music video was released for "Bugatti" featuring Future and Rick Ross. The song made a hot-shot debut on the Hot R&B/Hip-Hop Songs chart at number 42. "Bugatti" has since peaked at number 33 on the Hot 100, becoming Hood's most successful single to date as a lead artist, and his first top 40 hit since "Out Here Grindin'". On February 19, 2013, it was announced that Trials & Tribulations would be released on July 16, 2013. On April 7, 2013, in an interview on Power 99 Philly with Mina SayWhat about his "Trials and Tribulations" album, Hood opens up about his family and deciding to go a different route with this album, working with Anthony Hamilton and John Legend and plans to get Lil Wayne and Kendrick Lamar to feature on the album too. On May 6, 2013, Hood released the remix to "Bugatti" featuring guests DJ Khaled, Future, Meek Mill, T.I., Wiz Khalifa, Birdman, French Montana and 2 Chainz. On June 5, 2013, Hood released the second single called "We Outchea" featuring his Cash Money label-mate Lil Wayne. On June 26, 2013, the final track listing was revealed featuring appearances from Meek Mill, Anthony Hamilton, Chris Brown and Betty Wright. Hood released his Starvation 3 mixtape on January 17, 2014. The free project included features from We The Best label-mates Vado and Mavado, as well as Betty Wright and Kevin Cossom. Production for the mixtape came from Cool & Dre, The Renegades, StreetRunner, and The Beat Bully, among others. Body Bag 3 was released on August 29. Two months after that, Hood would team up with Rich Homie Quan for a return single titled "We Don't". Hood and his longtime girlfriend, Shanice Tyria Sarratt, had twin girls, Lyric and Sailor Blu McColister, on May 25, 2011. Lyric died shortly after birth due to health complications. ^ a b Concepcion, Mariel (2008-05-20). "Ace Hood". Billboard. ^ White, Omari (August 24, 2017). "Ace Hood Talks New Music, Evolution as an Artist & Life After 'We The Best'". Respect. Retrieved July 2, 2018. ^ Cordor, Cyril (2008). "Ace Hood > Biography". allmusic. Retrieved 2009-03-10. ^ a b Reid, Shaheem (2008-05-09). "Shawty Lo Wants To Confiscate T.I. 's 'Hood Pass; DJ Khaled Banks On His New Artist Ace". Mixtape Monday. MTV News. ^ "Check out the (3) Cover for XXL's Dec. Issue (#109)". XXL. 2008-10-20. Archived from the original on 2008-11-05. ^ Paine, Jake (2011-09-07). "Ace Hood Plans Hustle Hard Tour, Dates Revealed | Get The Latest Hip Hop News, Rap News & Hip Hop Album Sales". HipHop DX. Retrieved 2012-03-30. ^ Horowitz, Steven J. (2013-01-09). "Ace Hood "Starvation 2" Mixtape Tracklist & Cover Art | Get The Latest Hip Hop News, Rap News & Hip Hop Album Sales". HipHop DX. Retrieved 2014-08-09. ^ "Ace Hood f. Rick Ross & Future - Bugatti | New Hip Hop Music & All The New Rap Songs 2011". HipHop DX. 2013-01-17. Retrieved 2014-08-09. ^ "Video: Ace Hood f/ Future & Rick Ross – 'Bugatti'". Rap-Up. Devin Lazerine. February 7, 2013. Retrieved February 7, 2013. ^ "Ace Hood Trials & Tribulations Trailer". Rap Radar. 2013-03-08. Retrieved 2014-08-09. ^ Meara, Paul (2013-06-26). "Ace Hood "Trials & Tribulations" Release Date, Cover Art & Tracklist | Get The Latest Hip Hop News, Rap News & Hip Hop Album Sales". HipHop DX. Retrieved 2014-08-09. ^ "Here's The Tracklist To Ace Hood's 'Trials & Tribulations' - XXL". Xxlmag.com. 2013-06-26. Retrieved 2013-07-16. ^ "Ace Hood - Starvation 3 | Download & Listen [New Mixtape]". Hotnewhiphop.com. 2014-01-17. Retrieved 2014-08-09. ^ "Ace Hood - Body Bag 3 | Download & Listen [New Mixtape]". Hotnewhiphop.com. 2014-08-29. Retrieved 2014-11-19. ^ "Ace Hood - We Don't Feat. Rich Homie Quan | Download & Listen [New Song]". Hotnewhiphop.com. 2014-10-24. Retrieved 2014-11-19. ^ SOHH.com. "Ace Hood Discusses Daughter's Death, 'I Know God Does Everything For A Reason'". Archived from the original on 2013-03-15. ^ "Lil Wayne Leads BET Hip-Hop Awards '11 Nominations". Rap-Up. September 7, 2011. Retrieved May 30, 2017. ^ "Here Are The BET Award Nominees". Complex. August 23, 2013. Retrieved May 30, 2017.